When it comes to washrooms, you don't get a second chance at a first impression and research shows that a commercial air freshener dispenser can make all the difference. Our intelligent, automatic air freshener dispensers will make using your facilities a pleasant and refreshing experience for every customer. With free installation available and flexible servicing options to keep your air freshener dispenser topped up, we offer the best air freshening service in the UK. You can choose from a wide range of fragrances and coloured finishes with our commercial air fresheners to give your washroom the perfect finishing touch. Get a free Quick Quote today for all your air freshening needs. 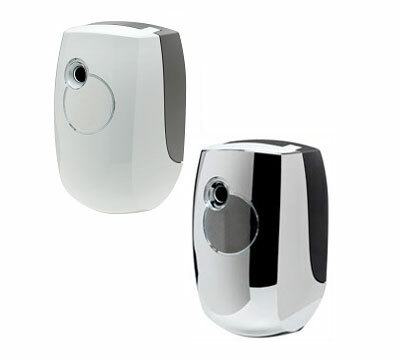 To help you continue your washroom colour theme and style, we offer our automatic air fresheners in two colours; White or Polished Chrome. Their sleek and modern shape is designed to look good long-term, and has anti-vandal protection with hidden batteries. With a selection of 6 delicate air freshener fragrances, you can choose one to suit your personal preference. We have: Punchy Orange, Floral Breeze, Fresh Vanilla, Baby Fresh which all incorporate the Odouraze odour neutraliser, and also Dewberry and Glacier scents. We can also change your fragrance on the next service if you'd like to try a different scent, and keep your washroom smelling clean and fresh. Most aerosol air fresheners are harmful to the environment and are difficult to dispose of. Within our air care range, we also offer an aerosol alternative so that you too can maintain your green credentials. Our patented Gel block will fragrance your washroom through an internal fan built into the dispenser unit to provide a pleasant experience.